Are we expecting more than we should when it comes to customer service? Because we can buy most anything we want electronically and often with the promise of discounted prices, consumerism has shifted. Department stores and independent boutiques are much more service oriented than they have been in the past twenty years owing to this popular shift to purchase goods online. Historically luxury storefronts have always had relatively good reputations for customer service. I emailed my contact sales girl at the Calgary TB boutique asking her if she had them (a pair of bright coloured Revas - see the former post on the bright yellow ballet flats) in my size. The reply was: sorry there are none your size in Canada. Oh well, I snooze I lose. The next day I received an email from her again: was I going to Arizona soon because they have my size and she knows I shop at the TB in Scottsdale. No trips planned anytime soon. Again, no big deal. I could have them shipped here but that would cost approx $50. A short time later another email. The manager of the Calgary TB store was going to Scottsdale for a meeting and if I would pre-pay, she would bring them back. Now I called Seleen and we talked. I said, "that is way beyond the level of service I expect and that is too much to ask to have Stephanie, the manager, bring them back" She said "Stephanie doesn't mind, she's standing right beside me and she insists on bringing them back for you." Now, obviously Brian is a good customer and that is the incentive for Seleen and Stephanie when making this particular proposal. A sale is a sale and they both look good. Really I'm not undermining their motivation. In fact, I imagine that if I was in the store at that moment, even if I was a first time customer, they might have done exactly the same for me, all things considered. Circumstances and timing can as easily determine a similar scenario for a "stranger". It's because Seleen and Stephanie have the personality types and not because of TB customer service protocol. Policies are written, protocol is allegedly enforced but sales staff may or may not carry them out. However, they both sound like nice people who are considerate in all they do, not just because a particular protocol is required. Brian acknowledges that, although he loves the shoe, it is the sales personnel who keep him going back. Brian too is a nice guy and he sent a thank-you note and a coffee card in appreciation for their efforts. Seleen responded in the following way, even though she didn't have to say thank-you for the thank-you . . . Thank you so much . . . that was really nice of you . . . There's no need to thank us on our end, that's just what we like to do for our clients . . . Can't wait to see you again in our store! Salut to Seleen and Stephanie at the TB boutique in Calgary, Alberta, Canada! May we all have the opportunity to have similar customer service experiences. Coming soon: I have much more to write about customer service, particularly when returning a substandard product . . . But of course, one more thing, here's Brian wearing his new Tory Burch bright yellow flats at the West Edmonton Mall - nice backdrop! 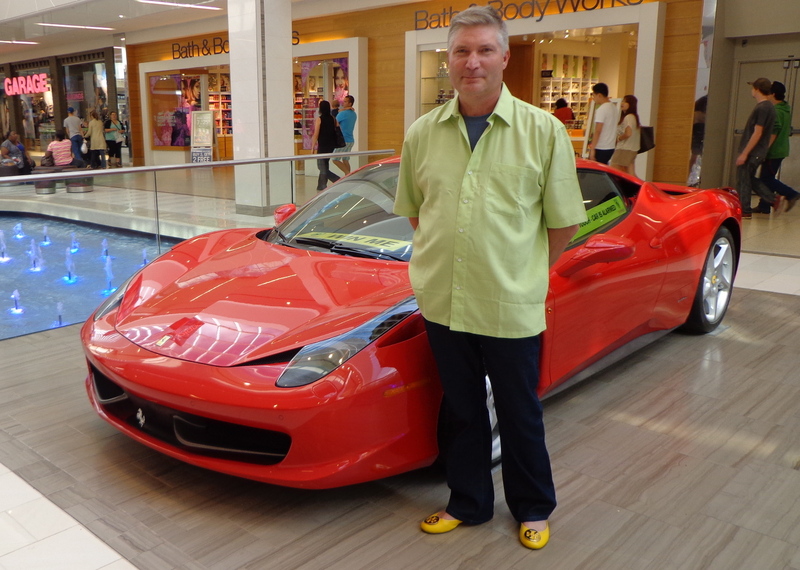 Brian Davis wearing the bright yellow TB flats at the West Edmonton Mall. Photo source: Brian Davis, Calgary, Alberta, August, 2013. Well I'm glad he had good service but it's not the same at other Tory Burch shops and getting any online support is questionable. Hope for more positive results elsewhere. Maybe it's a man thing. I wrote the post but the truth is I don't even own a pair of Tory Burch shoes. Brian is my "man of the hour" and I wrote about his experiences. Perhaps others will find their way here and discuss customer service at Tory Burch. You do raise an interesting point though - the fact that he is male may be a novelty but like I said, a customer is a customer and a sale is a sale. I'm not surprised to see people question the service I've received and why "I" rate it as EXCELLENT. I have heard/read lots of negative feedback on Tory Burch boutique service and on-line service. Maybe it is a male thing. I guess if you are a sales person at a high end boutique that specializes in women's clothes and shoes and a male comes in and buys something for themselves the sales person might take note. I know that when I walk into the TB boutiques I am greeted as "Hi Brian" Male thing or not always I feel welcome. As for great service I like to think that I deserve great service because I'm a repeat customer and I treat the staff as friends. Tory Burch is a high end boutique. Some unhappy customers that enter the store maybe have too much money and expect spa like treatment and on some occasions talk down to the sales associates. After all $200 plus for a pair of flats??? Lots for some and a drop in the bucket for others. When I go into a Tory Burch boutique I like to know what's new the my sale persons life and treat them like friends, It not just all about me. As I was writing this I received and message from my friend Lindsey. She worked at the Scottsdale TB boutique. She sold me my first pair of black patent Revas and then 2 more pairs of Revas after that. That was 2 years ago. She left Tory Burch a year and a half ago to purse other interests but set me up with my present contact Jessica at TB Scottsdale. Lindsey moved to NYC but this recent email told me she just moved to LA following her new dream. She has still kept in touch. A true friend. One final thing. This world is shifting to on-line everything. I still prefer the person to person contact when making an expensive or important purchase. The expectation are met (or not met) before you leave the store. This avoids the online hassle. Your points are valid and really quite basic - no matter where we are, it's all about relationship. The first thing you do when entering a shop in France is say, "Bonjour". It's just the way it is and whether you buy something or not, you say, "Au revoir". Then of course there are the parameters the sales associate must work within - he/she can't offer you something the store doesn't have or has a policy against. But they can listen, empathize and make suggestions as you so happily found out! Hopefully others will find this "discussion" and put in a word or two of their own experiences. Wow,that is an amazing picture! !Those yellow TB ballet flats really look good in front of your car, Brian!! My philosophy in dealing with all people, is to, "treat someone the way you would like to be treated"...it is interesting dealing with/observing people in the service/retail industry...the impression/feedback you get is that some individuals are only there to get a pay cheque...they hate their job and you are inconveniencing them...others, like the Tory Burch staff Brian dealt with, provide exceptional customer service...I think that is a combination of how they are brought up, that's who they are and their mentors (manager/supervisor)... Kudos, to Brian for recognizing the staff with thank you notes and coffee cards...I take every opportunity to recognize and acknowledge great customer service...It is amazing the uplifting response (smile and thank you)that I receive in return...a smile, thank you, pat on the back will only encourage positive outcomes!! You are so right, positive behaviour begets positive behaviour and whatever you send out, comes back to you in some way, shape or form (even though it may not be instantaneous). Thanks for the comment Pink Panther and I wrote that with a big smile!